A visit to Pikes Peak was part of our itinerary during out July 2008 visit to Colorado. 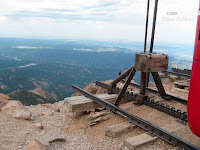 At 14,110 feet above sea level, Pikes Peak is the most visited mountain in North America. There are two options we considered for reaching the top. One is to drive and the other is to take the cog railway. We opted for the cog railway and I’m glad we did. It would have been tough driving the road and enjoying the vistas at the same time. Plus, with the 14K altitude, we wondered if we would be OK driving. The cog railway was the obvious choice. The seats on the cog railway are reserved, literally. We lucked out and got the first row, right behind the huge picture window. The first part of the trip was so-so, as we went through low forests. Then we started going through beautiful aspen groves, and finally, we were above the tree line and we could see for miles and miles. Once we reached the top, we wandered around, looking in all directions. It is just amazing. And the 14K+ altitude? Yes, we both felt it. 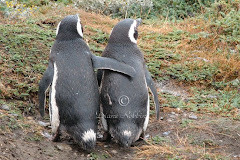 We had been at 13K+ in Cusco, Peru and felt a bit tired but nothing like this. This time we both felt lightheaded and, at times, dizzy. With no bathrooms on the train, a stop at visitors’ center at the peak was on the agenda. It is also possible to buy food there. They had a stand selling fresh fried cakes and I succumbed and bought two. They were great. We were lucky in that we had a pretty clear day. From the top we could see all the way to Kansas. And the bumper stop at the end of the line caught my attention. This is supposed to stop the train from heading off into nowhere??? Maybe being a cog railway it would but I'm glad it wasn't something we had to worry about on our trip.